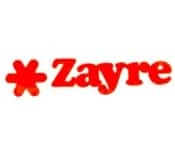 Zayre was a chain of discount retail stores that operated in the Northeastern, Southern and Midwestern United States from 1956 to 1990. The company’s headquarters was in Framingham, Massachusetts. The successful BJ’s Wholesale Club and TJ Maxx chains are spinoffs from Zayre. In 1988, the Zayre department stores were sold to the parent company of the competing Ames chain, and Zayre’s other businesses continued as the TJX Companies. The Zayre chain ceased to exist two years later, in 1990, although TJX is still in operation today.